“Guiding is my hobby and career. I like walking and canoeing because you can share a lot more knowledge with guests and teach them about all the flora and fauna and birds and insects.” Meet Victor, one of the passionate guides at Royal Zambezi Lodge. 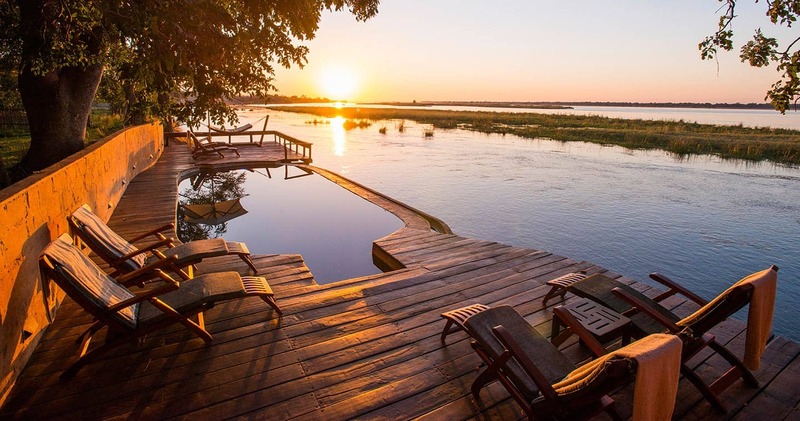 This privately owned property is situated on the banks of the Zambezi River, bordering the Lower Zambezi National Park (a ten-minute drive). Sited at one of the rivers broadest points with over three kilometers of river frontage and stretching over 200 hectares, this lodge is a true treat for all your senses. From wherever you are in the camp – perhaps your private deck, or in your outdoor bathtub – you will fully enjoy Royal’s prime location boasting outstanding bird and wildlife views, with the scenic mountain backdrop of the valley escarpment. And although the camp offers a wide range of safari activities, you can also decide to embrace the lodge’s DNA-policy (Doing Nothing at All). However, you will have a hard time doing nothing. With elephants and other animals roaming the camp on a daily basis, you probably want to, at the very least, keep constantly photographing. Then again, you can always escape to the Bush Spa where ‘doing nothing at all’ might be easier achieved. There are fifteen tented rooms and suites that include a family unit and three Presidential Suites. All stand-alone and spacious, the large green canvas tents under thatch roofs are positioned for maximum views and complete privacy. 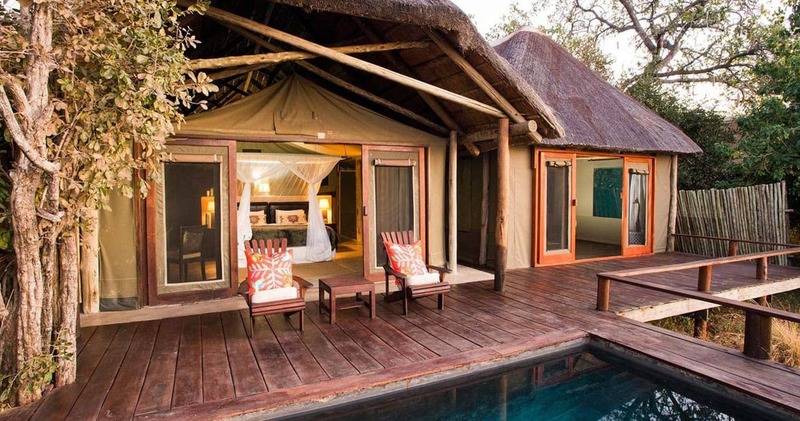 All tents are impeccably furnished with a contemporary style, comfort and muted bush colours. 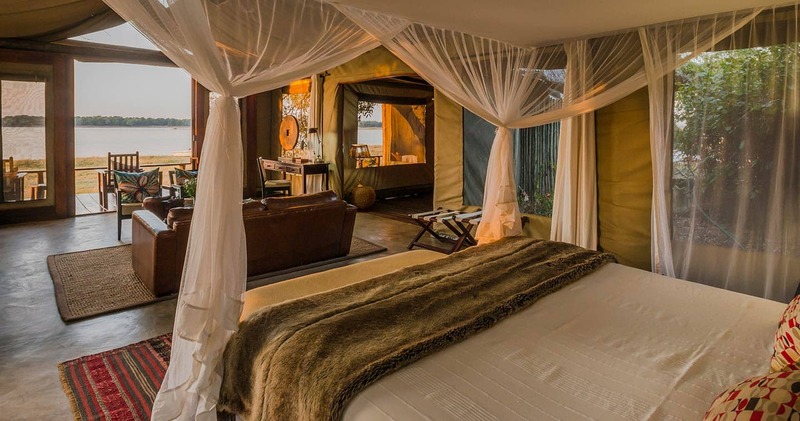 With size and en-suite facilities being the differentiating factors, all tents and suites include king size beds, comfortable sofas and airy verandahs. Tents are also equipped with mosquito nets, fans and hairdryers (on request). The central building with its lofty thatched roofs and open-plan is comprised of a reception area, dining room with fireplace and elegant lounge with more cushy sofas. This is surrounded by a wide shady deck with copper roof for al fresco dining or afternoon tea. Timber decks and terracing extends over the floodplain where there is evening campfires. Last but not least: this camp offers amazing spa-treatments. 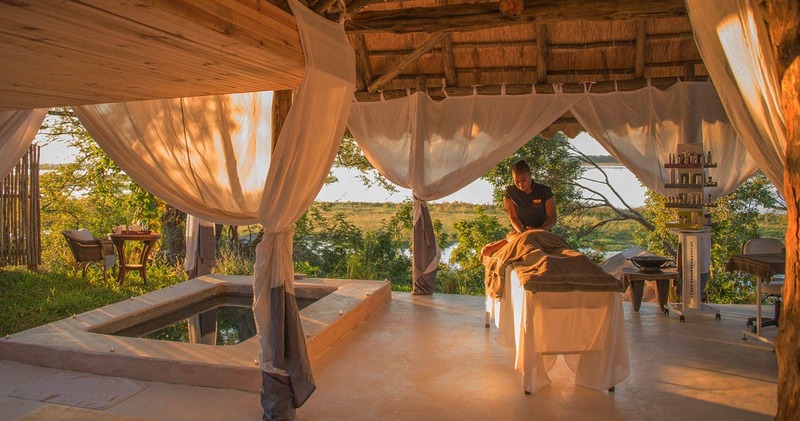 The Royal Zambezi Bush Spa won several awards over the years and includes two treatment rooms, a steam room, jacuzzi and refreshing plunge pool. Pamper yourself with a recovering body massages, or a nourishing sea mud wrap; all therapists use local products enriched with indigenous ingredients. A river safari is never predictable, but even when knowing this upfront, the encounters with wildlife are mind blowing. What might look like tranquil waters in the morning can become a watery stampede of zebras in the afternoon. Or how about a complete elephant family crossing the water, with their trunks snorkeling for air? 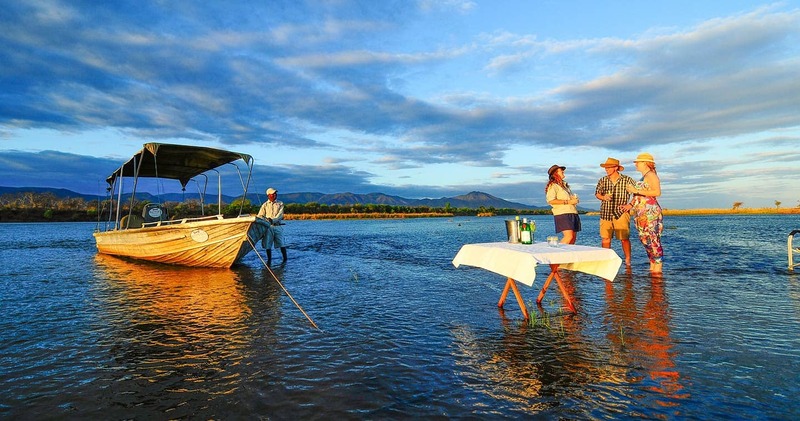 Good thing the location of the Royal Zambezi Lodge was chosen for the opportunities to experience a wide variety of activities. Game drives are still the best way to view and photograph large predators like lions. Or request a night game drive to spot leopards. Flexibility is the backbone of this lodge, so the possibilities are endless. After a game drive, you can decide to go on a canoe trip or sunset river cruise. Game viewing from this lower perspective is magical, as you are truly up-close-and-personal with wildlife. Explore the channels and true beauty of the river and get even closer to herds of elephant, buffalo or hippos that line the river banks. Besides these activities, walking safaris, fishing, fly-fishing and a cultural village tour are also offered. Or just opt in for the earlier mentioned ‘DNA activity’ and pamper yourself with a spa treatment. Together with a dedicated staff, excellent food and even better views, you will feel like a royal during your entire stay. Book your Lower Zambezi safari adventure at Royal Zambezi Lodge for three nights and stay an extra night for free! This special offer is valid through 31 December 2019. One of the finest, most interesting places I've ever been. Truly amazing. The animals on the property were so cool. Amazing views from each tent. Extremely comfortable bed and accommodations. Great food. And best game drives I've encountered anywhere. Great guides. The place is magical! We had the most fantastic time! The staff (Tiki and Billy) and our gorgeous guides (Chris and Shadrick) we so welcoming and friendly - not pretentious at all! Accommodation was just perfect and the food. The animals were amazing we did everything on land and water you could, we just wish we could have stayed twice as long! Can't wait to get back! Upon arrival at the private air strip we were met by an extremely helpful staff who transported us to the lodge. After a short briefing we were escorted to our "tents" where we settled in before a wonderful lunch on the deck overlooking the Zambezi River. The "tents" which have private, spacious bathrooms and beautiful, private decks from which we relaxed and enjoyed watching hippos, elephants and a variety of birds were anything but typical camping. Luxury at its best! The lodge is a great place to met and visit with other guest or enjoy reading one of the many books which line the tables or simply sit and enjoy the view. The pool and bar are located in the shade of a large tree and were a pleasant place to enjoy a drink and relax. The breakfast were wonderful and included fresh baked bread. Each meal was different, unique and very good. The game drives into the park were amazing and the morning stop for coffee, tea and biscuits were a treat and the cocktail stops for a gin and tonic and appetizers were very civilized! 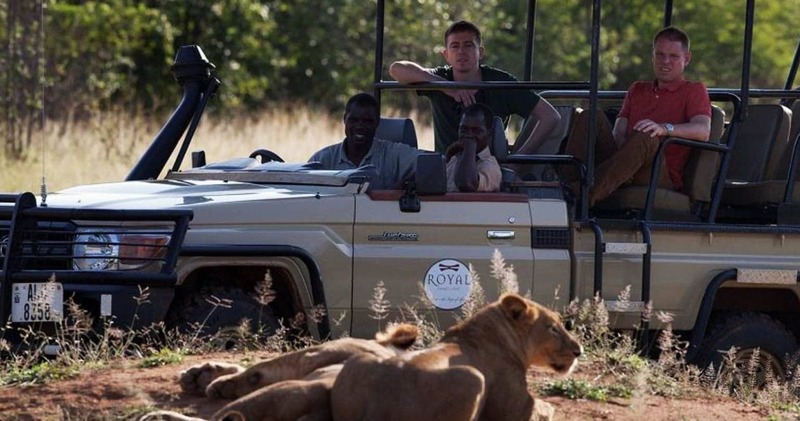 The lodge offers a variety of activities each day; but, the game drives were so amazing that we chose those everyday. The Royal Zambezi Lodge was a truly wonderful experience!!! The Bush Spa was a proud nominee of the World Luxury Spa Awards in 2015. Please note: Indicated price is for a 'Deluxe Tented Suite', which is the most basic room available at Royal Zambezi Lodge. A single supplement may be applicable. Special offer: Also see our special offer on the left. 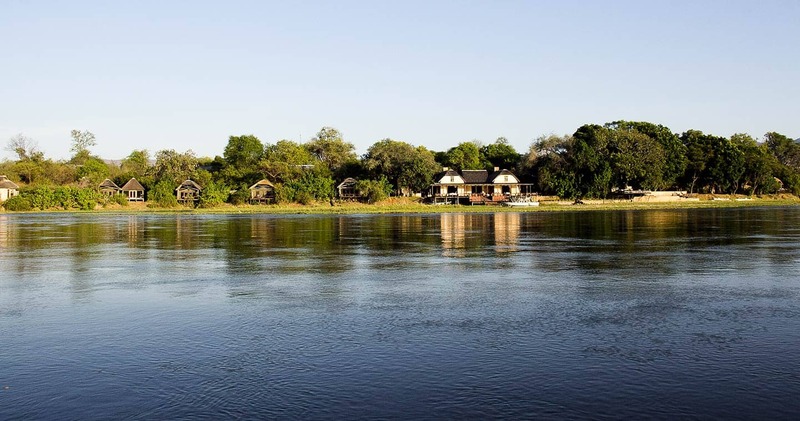 Read all about travelling to Royal Zambezi Lodge on our getting to Lower Zambezi page. Royal Zambezi Lodge is best accessed through Kenneth Kaunda International Airport (LUN) near Lusaka followed by a short light aircraft transfer to the Royal Airstrip. Children under 2 on request and free of charge. We hope you have found all information needed to decide that Royal Zambezi Lodge in Lower Zambezi National Park is the perfect place for your next travel adventure. Please fill in the contact form and we will get back to you soon!